After the Civil War, the more opulent Italianate style gained prominence in the United States; it was a mixed revival of Renaissance and Baroque motifs and was appropriate for Italianate and Second Empire interiors. It was the mid-nineteenth century way of expressing solid confidence in the progress of civilization, education and Western culture, emphasizing a continuum with the great European tradition of art and letters. 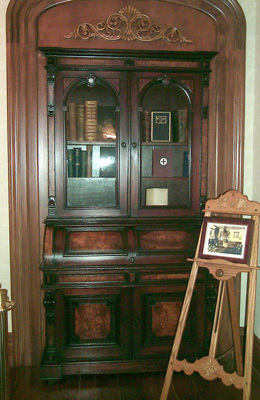 Features of the Italianate style which appear in the Library include segmentally arched window and door opening with broad deep casings, an arched fireplace surround and composite baseboard moldings. Many of the wallpaper designs are derived from hand painted and stenciled interiors from stately American homes built during 1860 - 70. 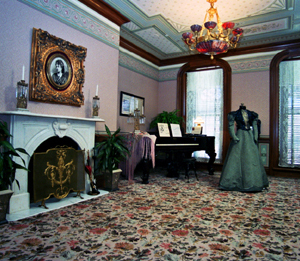 One example is the Lockwood-Mathews Mansion in Norwalk, Connecticut. Le Grand Lockwood, a New York investment banker, commissioned the house in 1868 and it was considered the most sumptuous private home at that time. Much of the lavish interiors have been attributed to Christian and Gustav Herter and featured classically inspired trompe l'oeil painted ceilings. 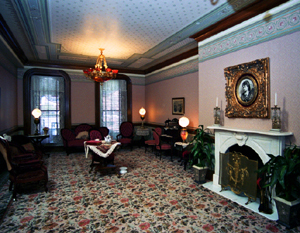 The parlor in the Victorian era always contained the best of furniture and décor the family could afford. Here, the ceiling design reflects the gentle curves of the interior detailing. The multiple borders represent polychromed plaster moldings defining a central fill paper derived from a stencil pattern. Matching patterns of entwining roses recreate hand painted treatments of the time. The female heads on either end of the ceiling were added to represent the importance of the First Ladies. The wallpaper frieze is adapted from an Italian Renaissance source. It is composed of conventionalized acanthus leaves framed by enrichments of wrapped laurel leaves and complements the cornice above. The library walls are treated in a restrained and formal manner as was appropriate. The preferred method for printing high quality wallpapers continued to be hand blocked, hence the walls are covered with a subtle pattern based on a Renaissance damask fabric. Period colors included tans, grayish green and warm beige; in this installation, the wall fill wallpaper was custom colored. A wood chair rail and paper dado resembling inlaid paneling completed the interior scheme. 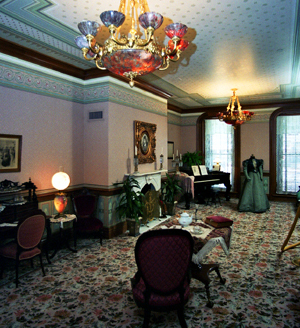 Approximately eighteen different wallpaper patterns were installed in this room.